"We work hard with our customers to help them use emerging IT technologies to drive their business forward in a cost - effective, secure and reliable manner. 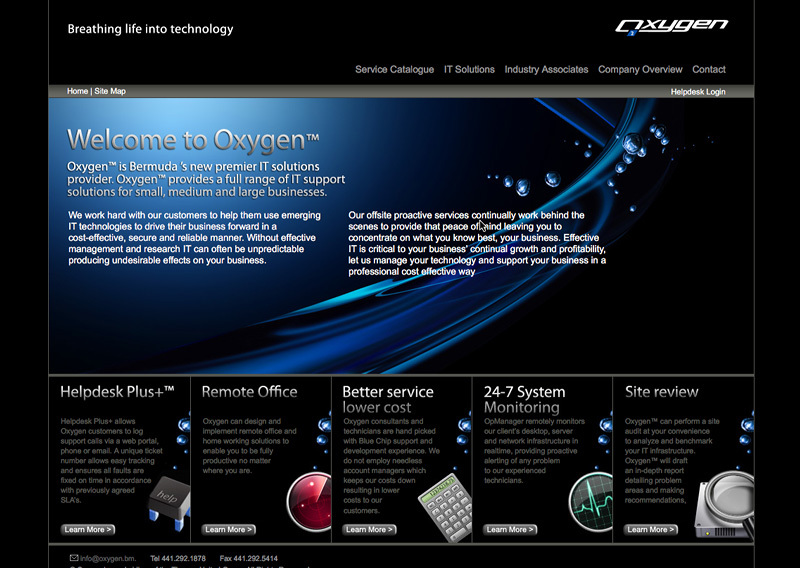 Without effective management and research, IT can often be unpredictable producing undesirable effects on your business....."
Oxygen.bm is Bermuda's premier IT solution provider, and required a site that reflected their quality of service and professionalism. Richard and I developed a site and layout that provided a relatively clean layout, and kept it easy to browse the large amount of information that the site holds without overwhelming the user. The success of the project led to the development of Create.bm, a sister company to Oxygen, in which we provide a thorough and industry leading design service to the businesses of Bermuda.